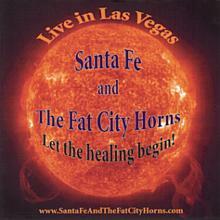 Live - Santa Fe and the Fat City Horns (2 CDs) has been added successfully to your wishlist. This two-disk, twenty-song CD was recorded live at the Palace Station in Las Vegas in 2005, and comprises a fiery mix of original songs and covers performed in the band's unrivaled signature style that effortlessly spans and blends the best in the funk, soul, salsa, and jazz genres with dazzling individual musicianship, soaring vocals, and an all-of-one-mind exuberant seamlessness. Bandleader Jerry Lopez assembled a 14-man crew of Vegas's finest show musicians for this latest iteration of his venerable group "Santa Fe" that arrived on the Vegas scene from New Mexico in the 1970's. Howling standing-room-only crowds have crammed into the new band's Monday night gigs ever since -- most of Vegas's other A-List performers and many visiting musical celebrities routinely among them. Note: This CD set is the audio-only version of the Live! - Santa Fe and the Fat City Horns (2-DVD) set and contains the same music. 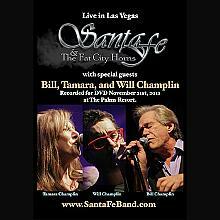 There are currently no reviews for Live - Santa Fe and the Fat City Horns (2 CDs), but you can be the first!